The mobile app world took to the freemium model with a passion last year, as revenue from freemium iOS(s aapl) apps eclipsed 50 percent mark in the US about a year ago. But in the last year, the momentum behind freemium apps has only grown stronger, according to new data from app analytics firm App Annie. App Annie Intelligence, which tracks more than 700,000 apps, found that global revenues for freemium apps on iOS have quadrupled over the last 24 months. 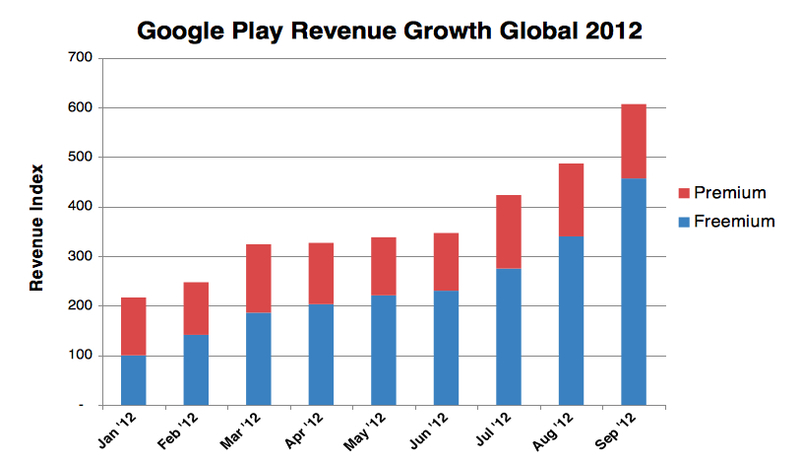 And for Google Play(s goog), worldwide freemium revenues have grown 3.5x in 2012. Now, freemium apps generate 69 percent of the worldwide iOS app revenue and 75 percent of global Android app revenues. Meanwhile, premium app revenue from paid download apps have remained relatively flat over the same periods. In January, IHS said that in-app purchase in freemium apps brought in $970 million in worldwide sale last year, or 39 percent compared to paid downloads. And freemium app revenue was expected to grow to $5.6 billion by 2015, representing 64 percent of the total market. The App Annie data, which is limited to iOS and Android, suggests we may be on a faster pace than IHS predicted. It’s not just in the US, where the figures generally mirror the world stats. App Annie said countries like China and Japan have rapidly adopted the freemium model in the last year. Japanese freemium revenues grew by 24x in the last year on Google Play and Chinese freemium revenue grew by nearly 25x on iOS since January 2011. Not every app needs to go freemium. As Flurry recently pointed out, some apps are better suited to that model. For example, apps with high intensity of usage in a short window creates an opportunity for developers to make money though in-app purchases that users can binge on. And for users who come back repeatedly over a long period of time, there’s also a chance to keep selling them on more content and add-on functions. Apps that don’t necessarily hold on to users over a long period of time might monetize better through one-time paid downloads, said Flurry. I suspect we’ll see paid downloads remain as a viable option for some developers. Instapaper’s success, for example, has shown that consumers will pay up front for a good product. But increasingly, the bigger money seems to be found in letting people in for free and then monetizing a smaller group of users over time through in-app purchases, subscriptions and other added features. I wonder what share of the market freemium has for productivity apps. Freemium is the predominant model with many of the top grossing game apps, but I wonder how relevant that is for non-game apps, such as health and fitness where you see very few freemium apps in the top grossing charts. Seems as though Chris Anderson’s book “Free” was correct. Does freemium include subscription-based apps like magazines? This could explain in part, the revenue bump? Yes, freemium includes subscription-based apps. Subscriptions are counted as in-app purchases. What is going on with Google Play? That chart suggests that Google play revenues have tripled in just 9 months while IOS sales have stagnated over the same period. I know Google Play is newer and therefore probably has a higher growth rate but that seems too big a difference to believe. Google Play has been experiencing tremendous growth in markets like Japan and Korea. Revenues in the USA are fairly stagnant so a large part of the revenue growth is coming from overseas regions. If you click through the blog post in the first paragraph you’ll see more data. google play has lots of room to grow. apple is already grown.